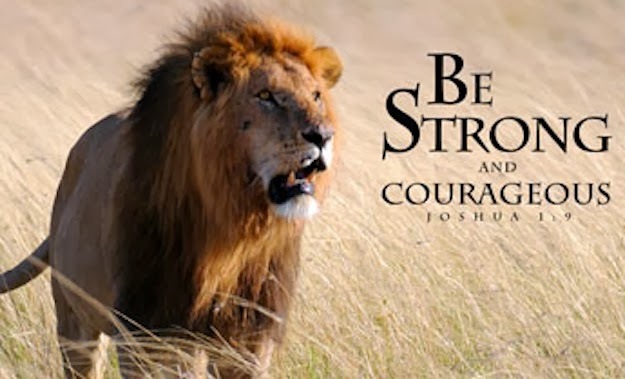 Joshua 1:9 -- "This is my command—be strong and courageous! Do not be afraid or discouraged. For the Lord your God is with you wherever you go." These are powerful words. Be strong. Be courageous. Do not be afraid. Do not be discouraged. These are the words of a God who loves you. Who wants to protect you. Who wants to guide you. Who wants to walk beside you through all of your troubles if you will only reach out to Him and ask. I am not strong. I am weak. I am often tempted by sin. I am selfish. I am human. But, I serve a God who is stronger than any sin or any temptation. I serve a God who is generous and merciful. I serve a God who gives me strength. I serve a God who finds courage in my timidity. With my God, I do not have to be afraid because I know He will stand up for me. I will not be discouraged because my God has perfect timing and works all things for good.